On 23 October, ESA published photographs made during the August eclipse on its website. The eye-catcher is a ‘chromosphere flash spectrum‘, captured during by ESA’s expedition team monitoring the eclipse in Casper, Wyoming, USA. During an eclipse, with the Moon temporarily obscuring the overwhelming light from the Sun’s photosphere, the normally invisible red hue of the chromosphere can be analysed. The chromosphere is the atmospheric layer directly above the turbulent surface of the photosphere. The image can be obtained with the last and first light of the solar limb, just before, respectively after the eclipse is total. This gives rise to the name ‘flash’ spectrum, as measurements have to be completed in a matter of seconds. At the exact moment this photograph can be taken, the Sun’s emission can be split into a spectrum of colours, representing the fingerprint of different chemical elements. 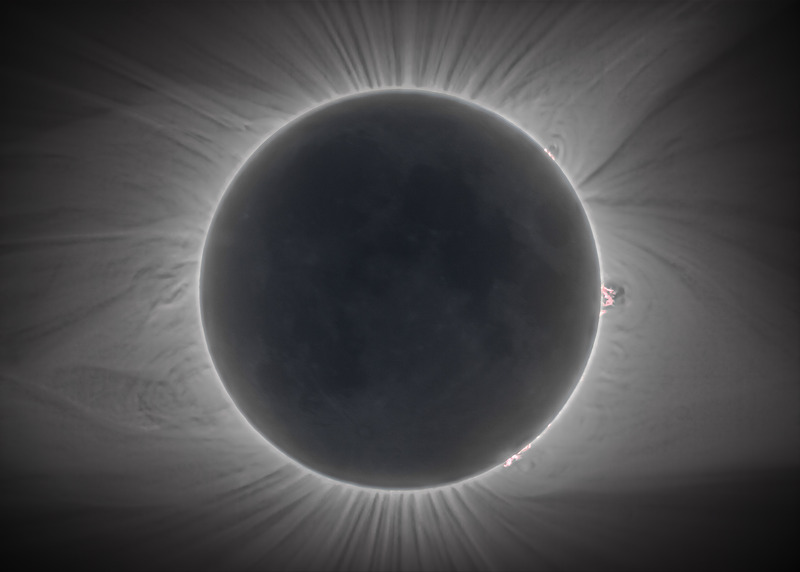 The above image was produced by the very first solar limb observable after the totality – and the time to take it was exactly 1/30 of a second. An image of the eclipsed Sun is on the left, with the spectrum of each point of the Sun superposed at the right. The strongest emission is from hydrogen, which includes the red hydrogen-alpha emission visible on the far right, and in blue and purple to the left. In between, the bright yellow corresponds to helium – which, incidentally, was seen for the first time in a flash spectrum captured during the 18 August 1868 total eclipse, although the element was then unknown. It would take three decades to discover the element on Earth, while it is now thought to be the second most abundant element in the Universe after hydrogen. But the eclipse was not only observed from Earth: astronauts aboard the International Space Station, and ESA Sun-watching satellites, enjoyed unique perspectives of this spectacular sight from space. One such views is the shadow of the moon on the Earth. As ESA explains, total eclipses are made possible by a quirk of our cosmos: the Moon’s average distance is just right for it to appear as the same size in the sky as the Sun. Though the Sun’s diameter is 400 times that of the Moon’s, it is also 400 times further away from the Earth. This is the reason that when the Moon aligns such, as to be directly between the Earth and the Sun, it appears to cover it completely. The Moon blocks out the Sun’s light, creating a total solar eclipse for those along the narrow path cast by the Moon’s shadow. Sun in HDR. Image taken during the totality without filter, with a Canon550D and a 1000mm refractor telescope. Several images were stacked and processed.